The wolves of Ellesmere have not been widely persecuted, so they have very little fear of people. They also exist without garbage dumps, so their full natural behavior can be observed. Big game hunting wolves from the northern subspecies are perfectly adapted to killing large ungulates. No pair of domestic dogs could kill even a winter weakened muskox. 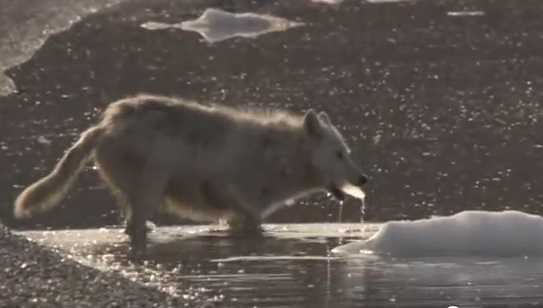 But through the wonders of evolution, these Arctic wolves can hunt muskoxen and caribou. Those that live a bit to the south, regularly grapple with moose. Dogs are much more easily compared to the more generalist southern subspecies of wolf, like pallipes, arabs, and whatever the Indian population of pallipes is. In perusing the names and descriptions of cryptids canids, I came across two animals that sound very similar. These are the waheela of Alaska and the Northwest territory and Ontario Giant wolf. Both of these are described as larger than normal wolves that are white in color. There is also another wolf from Inuit mythology called Amorak, who is a giant white wolf. The waheela is said not to hunt in packs, which is quite different from modern wolf populations. Well, I don’t happen to believe that there are any relict populations of dire wolf, hyena, creodont, or bear dog left in North America. I do think, however, that modern wolves are far more diverse in appearance than we realize– and have historically evolved in shapes that are mirrored with some exaggeration in their domestic form. For example, everyone seems to know about the dire wolf (Canis dirus), but did you know that there were large wolves of the C. lupus species that have very similar adaptations to those of the dire wolf? These wolves were not dire wolves, but an extinct population of modern wolves. In fact, these wolves are the ancestors of no living wolf or dog population. The indigenous people of North America surely knew of these larger subspecies of wolves. In fact, they probably knew a very diverse population of wolves, which we cannot imagine today. For not only were there coyotes and dire wolves, there were also many diverse forms of the C. lupus species. And as we know today, not all subspecies of wolves form packs. It’s very likely that the waheela and the mythology about Amarok are based on these extinct forms of modern wolf, which have survived in the folklore of the native peoples of their respective regions. Maybe these big game hunting wolves were not pack hunters. Who knows? Now, the Ontario white wolf could be a similar story– either the dire wolf or some unusual and extinct form of modern wolf has survived in the folklore of the indigenous people. However, I have a far more likely story. Everyone knows that there are large white wolves in North America, specifically in the northern reaches of Canada and in the praire provinces. The most famous North American subspecies with white fur-coloring is Canis lupus arctos. It is almost always white in color. They are born gray and stay that color for the first few years of their lives, but then turn white in color. Now, this subspecies is larger than both subspecies found in the more settled areas of Ontario, which are C. l. nubilus and C. l. lycaon. Neither of those are rather large wolves and virtually none of them are white, although nubilus sometimes comes in a cream color. Lycaon is almost always gray, although in its fomer range in the US, it was sometimes black. Most people living in those areas would be more accustomed to seeing wolves that looked like these animals. But what would happen if an Arctic wolf showed up? My guess is you’d get legends about a giant Ontario wolf that was white in color. But how would an Arctic wolf make it the settled areas of Ontario? Well, as the old Russian proverb goes: “A wolf is kept fed by its feet.” And as a result, wolves have evolved long legs and efficient gaits to travel vast distances. 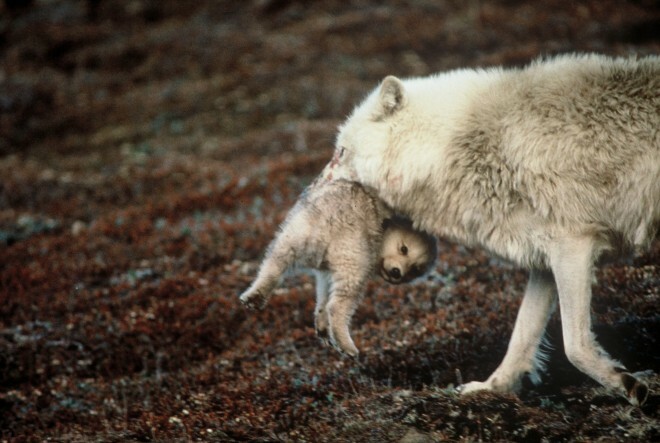 Sometimes wolves travel hundreds of miles from where they are born. In fact, when you wolves disperse from their natal packs, they very often travel a very long way to set up new territories. It’s a good strategy to prevent inbreeding. Perhaps a young dispersing Arctic wolf popped up in the settled regions of Ontario, where it was thought to be some sort of giant white wolf. I think a lot of these cryptid canines are nothing more than unusual subspecies of C. lupus, extinct animals that have survived into folklore, or hybrids. If you cross a domestic dog (especially those that don’t look like wolves) with a wolf, you have no clue what you’re going to get in terms of appearance or behavior. You could get a very strange looking animal indeed. In fact, I think this is why the people of eighteenth century France thought the Beasts of Gevaudan were some weird creatures. They were larger than any wolf native to France and far more aggressive. It’s very likely that these were hybrids between wolves and some French mastiff (an ancestor of today’s dogue de Bordeaux). The ancestral dogues were very aggressive, and what’s more, they often came in brindle coloration, which describes the “tiger stripess” the beasts perfectly. In fact, dogs of the mastiff type were used as weapons of mass destruction and torture in Spanish colonies in the New World. I don’t think the waheela or the Ontario giant wolves are hybrids. I just think they are either extinct subspecies that survived in native folklore or members of extant large white subspecies that wandered into areas where the locals were not familiar with them. Keep in mind that we are just now getting to understand how diverse wolves were in pre-historic times. This should be no shock to us. We see this diversity reflected in their domestic forms, which vary in size from the tiny chihuahua to enormous mastiff. We have bulldogs and pekes were very bandy short legs and flattened faces, but we also have long-nosed Afghan hounds and borzoi, which are built on gracile frames with very long legs. And most of this diversity in shape and size in domestic dogs has come about only in the past few centuries. However, dogs have varied in appearance and type since they were domesticated anywhere from 10,000 to 135,000 years ago. Now, think about that for a minute. If dogs can evolve into so many shapes and sizes in just a few millennia through artificial selection, imagine what wolves could evolve into through millions of years of natural selection in such varied habitats throughout their historical native range? So for those reasons, I don’t think the waheela and Ontario white wolf are separate species and certainly aren’t new species of canid.